The area around L'Ancresse Bay was quite heavily defended. Most of the defence works are now buried. At fort Doyle (Stp Nebelhorn) east of the bay a 670 and some light defences can be found. Remains of a bunker for a 'Sechsschartenturm' are visible. The next Stützpunkt is located at the headland to the west. It is a firing-range now and entry is forbidden when the red flags are high, so watch out! One Jägerstand, a 670 and a 606 were built. Only the roof of the 606 is visible today. On the hill 'La Grande Hougue' two Flak St bunkers can be seen. These are two Fl 242s. At the eastside of the bay itself a little resistance nest was built. 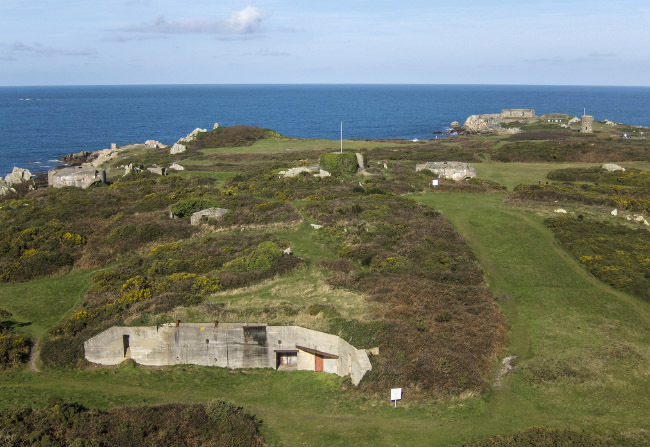 It consisted of a personnel St bunker, a St bunker for 4.7 cm Festungspak 36 (t) and several light Mg positions. The last nest in this area is Wn Golfwerk which consisted of a personnel St bunker and a St bunker for 4.7 cm Festungspak 36 (t). In the hills behind the bay several Flak bunkers form the 'Flak Batterie Dolmen'. The bunkers are located on a golf course!